A steel fence is a great way to add a polished look to any commercial or residential property with excellent function and design. Because we often hear so much about vinyl and wood fencing, steel and aluminum fences are often pushed out of the spotlight despite their many admirable qualities as potential fencing materials. If you are undecided about your next fence design, below are some reasons to consider steel fences as your winning choice. Steel fences offer a unique style to your property. Wood and vinyl are great for privacy fences and residential design, however steel fences offer a unique style to your property. Particularly for commercial properties, these thinner yet durable fences offer a stylish look to the perimeter of your business. For those who love the look of an iron fence without the hassle of maintenance, a steel fence is a perfect solution. Unlike iron, these fences do not require treatments for any type of rust or corrosion, keeping a great shine and clean look throughout the year. Higher steel fences can be an especially nice security feature for any property, as this material is much more difficult to manipulate than wood or vinyl. Many steel fences are also paired with electronic features to secure entryways of residential and commercial properties. The dark contrast of a black steel fence is perfect for shaping the parameters of your property, such as gardens, driveways, and commercial spaces with outdoor seating. This material looks especially polished next to lighter buildings made of brick or stone. One of our most recent commercial installations for steel fencing is in Elkridge, MD at Baltimore Coffee & Tea. 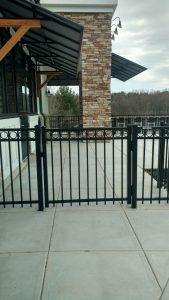 The sleek design of their new steel fence is a beautiful complement to their stone building and perfectly their outdoor seating area for the summer. We can’t wait to see it in action during the warmer months! 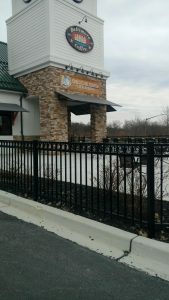 One of our most recent commercial installations for steel fencing is in Elkridge, MD at Baltimore Coffee & Tea.